comment Combine two I-Drive 360 attractions and enjoy huge savings on gate price. Enjoy admission to Madame Tussauds Orlando and to the SEA LIFE Orlando Aquarium. You will be sent a fully flexible open-dated ticket allowing you to visit the attractions on a date and time that best suits your holiday itinerary. You do not need to visit all the attractions on the same day should you not wish to do so, but both attraction must be visited within 30 days of your visit to the first attraction. Madame Tussauds Orlando: The world’s most famous celebrity wax attraction has arrived in Orlando! Enjoy red carpet treatment and indulge in the ultimate fame experience. Get ready to photograph and pose with your favourite A-listers, get on stage with your favourite pop star, challenge sports legends and even shake hands with the president! This brand new, immersive and interactive wax attraction is bursting with family fun. Who do you want to meet? SEA LIFE Orlando: Dive into an underwater world at SEA LIFE Aquarium and come fin-to-fin with more than 5000 marine creatures from around the globe! Find yourself surrounded by turtles and sharks as you enter the 360-degree ocean tunnel and stare in wonder at the spectacular floor-to-ceiling 12-foot ocean displays. See colourful fish, mystical seahorses, stunning blooms of jellyfish and giant Pacific octopus. Use your SEA LIFE Orlando tickets to find out the secrets of the Atlantic, explore beautiful tropical waters of the Indian Ocean and be amazed by the wonders of the Pacific. The I-Drive 360 complex located at the heart of Orlando’s International Drive. There are plenty of bars and restaurants at I-Drive 360, making it a great venue to visit at lunch times and during the evening. You will receive a voucher to redeem upon arrival at i-Drive 360, and can be used at any time on your holiday. The ticket gives you one admission to Madame Tussauds Orlando and SEA LIFE Orlando. This ticket does not include admission for the Coca-Cola Orlando Eye. The ticket expires after you visit the second attraction or after 30 days from first use. There is no refund should you not visit two attractions. Children must be accompanied by an adult (18+ years). Children aged 2 years and under fly for free. Do I need to book a date in advance? No, you will be sent an open-dated voucher to redeem at I-Drive 360 for fully flexible tickets that give you admission to Madame Tussauds Orlando and SEA LIFE Orlando, and can be used at any time on your holiday, subject to availability. The ticket expires after you visit the second attraction or after 30 days from first use. The I-Drive 360 complex located at the heart of Orlando’s International Drive. Free parking is available onsite. What time does Madame Tussauds close? What time does SEA Life close? 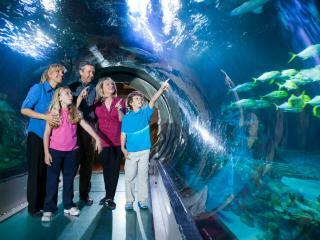 SEA Life is open daily, from 10.00am to 9.00pm.